1) Jump more often. Often the movement of the volleyball vertical jump isn't as efficient as it should be. If you are someone that is playing volleyball all the time (2 vs 2 or 6 vs 6 pick up ball) then you likely ARE getting in plenty of jumps. However, if you're someone that spends more time in the weight room than you do out on the volleyball court, then you'll need to add some plyo or specific jump training. Sometimes a volleyball coach will make the mistake going through an entire volleyball practice without getting in very many jumps. For example, if you decide your team needs to focus on passing and defense, and that’s all the team does the entire practice, your players are missing out on an opportunity to become efficient vertical leapers. 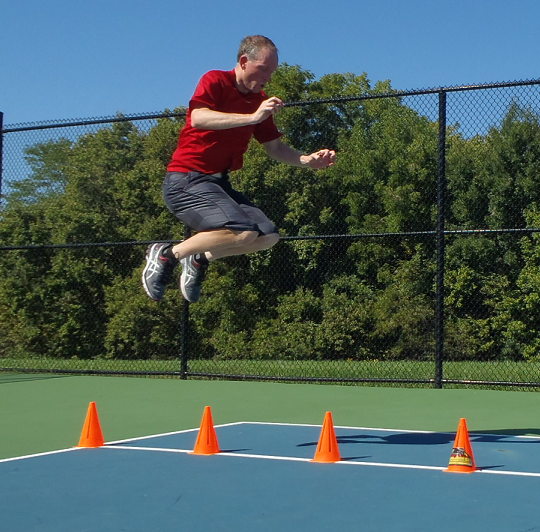 Always try to get around 80-100 ground contacts of plyos or jumps in 2-3 days per week. 2) Practice the specific movement. If you want your volleyball vertical jump higher, then you need to master the act of jumping. Practice is the best way to optimize all the neurological qualities contributing to a particular movement. So if you want to increase the height of your volleyball approach jump, then you need to optimize your approach to jump. And if you want to increase the height of your volleyball block jump, then you should practice more reps jumping up to block. 3) Strengthen glute muscles. In order to jump higher you need to get stronger. It’s also important where you get strong. If you strengthen your body in the wrong places, this can lead to muscle imbalances. The glutes are known as the powerhouse and for good reason. The most important muscle for extending your hip (moving your leg back) is the gluteus maximus. You want to be glute dominant (glutes stronger than quads/hip flexors). What is key is getting your body working efficiently so that all movements are driven by the correct muscles. 4) Stretch tight hip flexors. The hip flexors (psoas) are the most important muscle for hip flexion. Basically, the hip flexors are the muscles responsible for moving your leg forward (lifting your knees and feet up when you run or jump). The higher you lift your knees, the greater the degree of hip flexor activation you get. It is very common for tight overactive quad/hip flexors to inhibit glute function. Also, this is a common issue of athletes with knee pain. To prevent quad/hip flexor dominance, do 2 sets of 20-30 second stretches every day. 5) Perform new exercises. You’ll likely see gains in strength by doing new exercises because of the increased coordination. Just by switching up exercises every month or so you’ll likely see gains in strength on a more regular basis. Lift heavier weight ---> strength is increased. To get these results, you need to stimulate muscle mass which is supported by a higher caloric intake, which helps to continue increasing muscular strength. Consuming a lot of calories results in increased muscle mass (added body weight). So you might be thinking; Don't we need to be light to jump high? The key is to have a proper strength to bodyweight ratio. Nine out of 10 times the gain in bodyweight is offset by the gains in strength. My belief is you can save a lot of time by not worrying so much about a little increase in bodyweight. Strength gains will be SLOWER if you are focused on keeping a constant bodyweight. This is particularly true for athletes with a more ectomorph build (a person that’s naturally more lean). If you are overweight to begin with, then you’ll obviously need a different strategy (ex: a program to lower body fat percentage). 7) Working out vs training. There’s a big difference between just trying to get through the workout and trying to fully benefit from each exercise. Typically, a beginner will just try to get through the workout, crossing each exercise off their “to do” list. There’s a big difference between doing this and really experiencing every set and every rep of the entire workout. Beginners often do too many exercises and waste a lot of time not focused on training. If you think this sounds like you, try basing an entire workout on just TWO exercises. Don’t count sets. Just go in and have fun with it. 8) The ankle extensors. The vertical jump is a combination of knee, hip, and ankle extension. A typical strength workout emphasizes strengthening the knee extensors (quads) and hip extensors (glutes), but what about the calves? 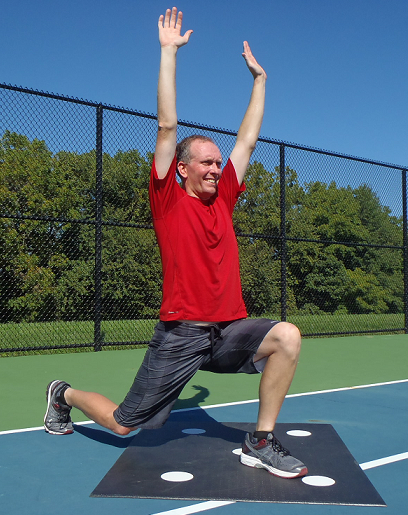 It’s true that most of your improvements in strength and power are going to come from the hip and knee extensor exercises, but it’s also important to increase ankle extensor strength which often gives an athlete another few inches in vertical leap. The ankle extensors can contribute quite a bit to the volleyball vertical jump. To strengthen the calves, 2-3 days a week do 2-3 sets of 20-30 reps of a standing calf raise variation such as the one arm dumbbell calf raise or the barbell calf raise.